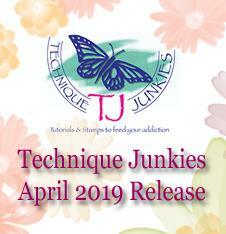 Believe: Technique Junkies April Release!! Welcome to another fun release from Technique Junkies. This month we have wonderful floral images, also lovely and humorous stamps, a little bit for every style. You can check out all the new stamps HERE. I have 3 projects for you today, I enjoyed coloring these images, coloring is so relaxing for me, actually the first image was colored in the waiting room while my husband was having surgery. Anyways, let me talk about these projects. Beautiful set, includes the floral wreath and 2 sentiments. Stamp wreath on white cardstock in black ink, color images with markers. Stamp sentiment in Cherry Ink, then fussy cut image. Add Gold Stickles to flowers and set aside to dry. Create a background using Chain Weave Stencil, Bubblegum Ink and a Blender Brush. Add panels to a white card base. Finally, add Nuvo drops to embellish. Beautiful Dahlias background, amazing image for different occasions. Stamp Dahlias Background on white cardstock in Black ink, color image with markers, add Gold Stickles to center of flowers. Set aside to dry. Stamp sentiment from You are the World set on white cardstock in Bubblegum Ink, cut it using your Cut Align. Blend ink around the Dahlia panel. Adhere panel to card, add Sentiment with foam tape. Beautiful giraffe image with amazing coloring possibilities. Stamp Zen Doodle Giraffe on white cardstock in Black Ink, color it with markers. Die-cut image with square dies. Add Nuvo drops and set aside to dry. Create a background piece using stencil and green and yellow ink. Stamp sentiment from Free Spirit Set in Cherry Ink. Add panels to white card base. Now, from today until April 8th, you can get the new release with a 15% instant discount! Plus, if you buy $30 or more, you get a free stamp!! Plus, if you use my TJ10Giovana you add an 10% extra discount!! Your cards always blow me away, Giovana! So pretty! Very elegant Giovana. I like how you coloured the giraffe and flowers. You did a bang up job.